After starting with FarCry, CASA then tried Source, with awkward results. "Importing into the Half-Life 2 engine has proved slow and problematic," Hudson-Smith wrote. "The requirement to create 'qc' files and compile models before even reaching the engine puts time constraints on the process that make it laborious for architectural models to be visualized." The situation improved with Oblivion. "It is a joy to work with and, with the use of plugins, a work flow can be produced to visualize models in under an hour." In September 2006, CASA built an Oblivion version of the university quad, then imported London's Millennium Eye Ferris wheel and an entire cityscape originally modeled in 3ds Max. Hudson-Smith has posted two tutorials on exporting from modeling programs and importing the models into the Oblivion engine, as well as a four-minute YouTube movie demonstrating the entire process. "Bethesda Softworks have done a good job with their Elder Scrolls Construction Set," Hudson-Smith says. "It is by far the easiest way to import models direct from 3-D modeling packages. The inclusion of a 'sandbox' with today's games is without doubt one of the major strong points in the industry. To be able to use a game engine (albeit not commercially) for under $40 is a fantastic step forward. "SketchUp has sped up the whole process; if you look at our 'UCL Quad in Oblivion' movie on our blog, you will see that it is photomodeled. This used to be in the realms of high-end photogrammetric software until SketchUp came along. Sure, the level accuracy is not quite as high, but it is a lot quicker and simpler to use." The Digital Urban blog entry "Rapid Photomodelling in SketchUp" shows how to model an entire building in under three minutes. Hudson-Smith adds, "Perhaps more important, it is also free, which opens up 3-D modeling to a whole new user base. SketchUp is our current modeling tool of choice; indeed, we only use 3DStudio Max for import and export, and that's quite a change." Through movies and tutorials on his blog, Hudson-Smith assiduously records a panorama of digital-architecture projects in Second Life, Project Gotham Racing and other 3-D platforms. All of these share the strength of real-time polygon pushing. "We loaded our 'Fantasy City' visualization into Oblivion," he says, "and suddenly we had 60 frames per second, compared to having to view it in 'box mode' within 3DStudio Max. Real-time lighting is also a plus, but also a minus in terms of an industry that needs to concentrate on highly realistic lighting simulations. The CryTek engine looks like it may address this issue, however, and has the potential to become one of the main ways to visualize new architecture in cities." Crytek's forthcoming CryEngine2 may prove to be a watershed. 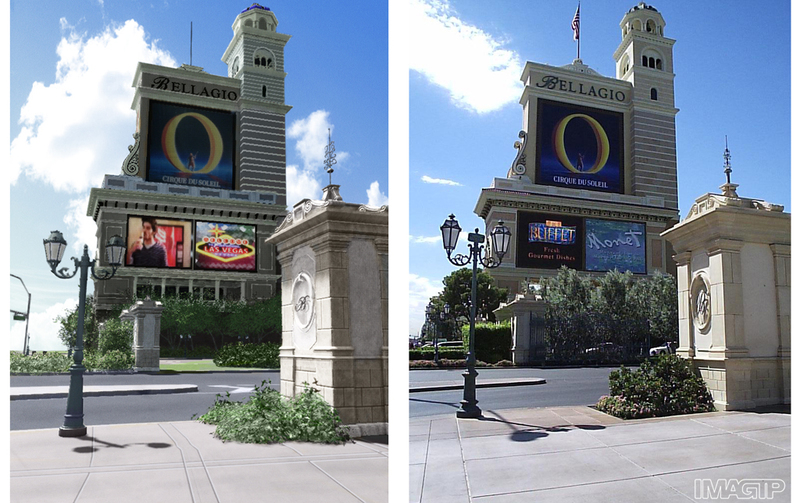 The first CryEngine2 licensee, French visualization firm IMAGTP, recently presented a screenshot of the Bellagio in Las Vegas, side-by-side with a photo of the actual casino. You have to look carefully to identify the fake. Hudson-Smith says, "The Crytek engine is looking impressive. ... The advanced lighting effects seem to offer the biggest breakthrough, although at the end of the day, a lot of it comes down to how easy the tools are for importing models. "Game engines are destined to play an ever-increasing role in the industry; people just need a little vision, and to get over the word 'game.' Every architect's office should have an Xbox 360 or PS3, if only to remind them of the level of graphics they should be aiming for." That's the view from the architect's side. Should gamers care? Will ordinary gamers really want to use their favorite games to design, not deathmatch and capture-the-flag, but mundane buildings? Sure, some of them will. 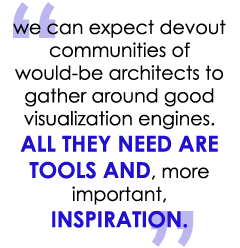 Just as some gamers rose from their couches to the filmmaking challenge when machinima came along and others started making podcasts and videos when those tools became cheap, we can expect devout communities of would-be architects to gather around good visualization engines. All they need are tools and, more important, inspiration.